It is not surprising that Heiner Mülller’s “Die Hamletmaschine” (the Hamlet-machine) inspires contemporary composers. Written in 1977 in reaction to Müller’s own confrontation with Shakespeare’s play, it is hard to define what the piece is: a play (certainly not in the traditional sense, with dramatic and/or psychological confrontations of characters), a dramatic poem? But certainly, a cryptic, wild, turbulent and raw flow – a flood even – of words and violent images. 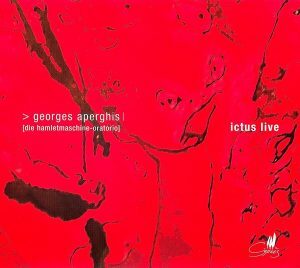 Georges Aperghis was born in Athens in 1945 but established in France in 1963. He was one of the inventors, in the early 1970s, of “théâtre musical” – music theatre – and still is today one of its main exponents (see my review of Sextuor – L’Origine Des Espèces). He’s also written large operas – the most recent ones being “Tristes Tropiques” after Claude Levy-Strauss, premiered in Strasbourg in 1996, and “Avis de Tempête” (Lille 2004). He is one of the most inventive and original composers for contemporary vocal techniques, as his masterful 14 Récitations from 1978 bear witness. 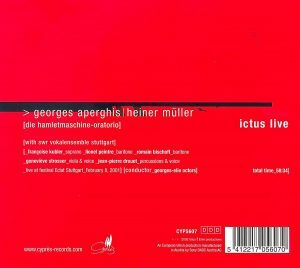 He completed his own Hamletmaschine in 2000 and called it an “oratorio”, but its form is as open as Müller’s original; it is very easy to imagine it being staged. It uses one soprano, two baritones, one solo viola-player and one solo percussionist both acting as speakers, a large chorus and an instrumental ensemble. The Müller text has inspired Aperghis to a composition that is rough, wild, unruly – much more than what he usually does. The chorus sings the Müller text in the original language – Aperghis says he wanted to retain the impact of the German language -, but the soloists speak and sing in French, in the translation of Jean Jourdheuil, who staged the world premiere of Müller’s text in this same translation, in Saint-Denis (a northern suburb of Paris), back in 1979 and who, twenty years later, tutored Aperghis, so to speak, into this complex and intractable work. The chorus is mostly treaded in massive and brutal textures – a mob. The instrumental ensemble is more gossamer, with much gnarled but often subtle and subdued interplay between solo viola and other instruments. But the music can also be jagged, piercing, aggressive, violent (reminds me of Nono’s Intolleranza 1960 or Al gran sole carico d’amore), non-linear, like layers of music interrupting one another. With the soloists, Aperghis uses the entire gamut of vocal styles and techniques: spoken, sung, shouted, intelligible, unintelligible, syllables and phonemes, Hamlet text spoken with syllables shared between the two baritones (track 4 starting at 3:20), gasps, sobs, laughs. Not easy-listening, but then Heiner Müller’s text isn’t either and music set to it shouldn’t be. Only one drawback: only the text being sung is given in the liner notes – no English translation. But some of Müller’s text can be found on the web. See my other reviews of the music of Aperghis, and the list of CDs that I have but haven’t yet had the time to hear and review.